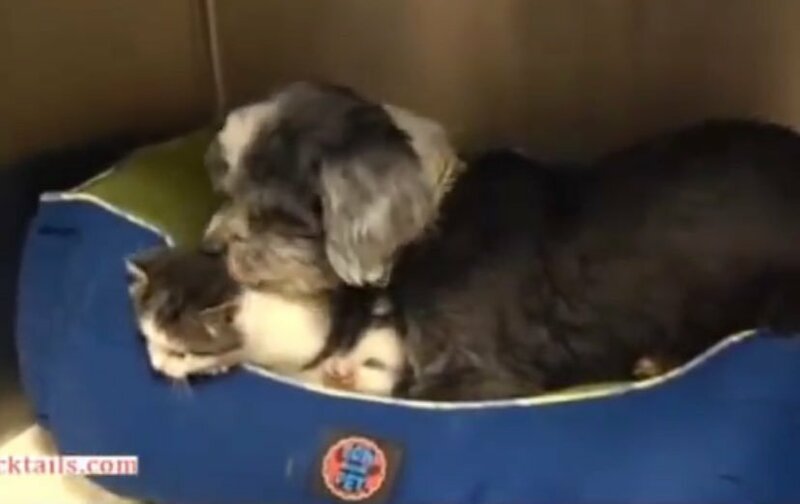 A small dog from South Carolina is making headlines today for courageously saving a kitten’s life over the weekend. But the story doesn’t end there — the pooch went into the rescue a hero, but came out of it a new mom. Anderson County Animal Control Officer Michelle Smith was called to the scene after a resident reported a dog barking frantically near North Pointe Creek, behind the local Home Depot store. When Smith went to investigate, scooting down an embankment towards the sound of a dog howling, she found the dog lying in the grass, a small kitten nuzzled up beside her. Smith believes the dog likely pulled the kitten from the ravine and tried to carry the kitten to safety, but when the embankment proved too steep for the dog to manage she was unwilling to leave the tiny cat behind. Smith, who has worked with animals for nearly 20 years, was surprised but touched at the way the dog cared for and protected the kitten she’d rescued. What’s more, Smith noticed the dog was nursing the kitten, who had likely been orphaned and was too young to eat solid food. “I was completely shocked, you know, but at the same time it was a really happy moment,” Smith says. Officer Smith transported the unique mother-and-adopted child pair to Anderson County PAWS, where the duo is relaxing today. PAWS Director Jessica Cwynar tells FOX Carolina the pup is likely going through a kind of pseudo-pregnancy in order to produce milk and nurse the young kitten, but that PAWS staff is also bottle-feeding the kitten to make sure he is getting enough to eat. The hero dog was wearing a collar and appeared freshly groomed when she was found by Officer Smith, so it is believed the dog is someone’s recently-lost pet. The dog is estimated to be at least 5-years-old and is in good health. Anderson County PAWS will hold the dog and her adopted kitten for two weeks to give the dog’s family a chance to come forward. PAWS staff stresses that veterinary and grooming records will be necessary to prove ownership. But if no one should contact the rescue and claim their dog within that time, PAWS plans to put the unusual canine and kitten pair up for adoption. “This is one example of why I love my job,” Smith says in her incident report.